How is the 'Alala Hawaiian Crow Connected to my Art Form? "Ho'o ku'u A Heahea 'Alalā "
I was honored to receive an Honorable Mention award at the Volcano Art Center last Saturday night (September 4th, 2016) for my entry in the multimedia juried art contest - "Return of ‘Alalā: Restoring The Voice Of Hawaii’s Native Forests". The show runs through October 9th and is absolutely phenomenal! I was thrilled to be accepted into the show (there were over 80 entries, with about 40 chosen for the show). The ‘Alalā is the Hawaiian black crow that was almost extinct. "In conjunction with the long anticipated release of the ‘Alalā Hawaii’s native crow, back into the wild. Volcano Art Center is partnering with San Diego Zoo Global and the Keahou Bird Conservation to display a juried, multi media exhibition of the ‘Alalā. The exhibition will provide extensive education featuring the ‘Alalā as an important bird in Hawaii’s ecology and native culture and double as a fundraising effort to support the release with will begin in November 2016 and continue over the next 5 years." This exhibit was special to me because if it were not for the ‘Alalā project done by the San Diego Zoo, I may not be working in palm sheath fiber today! Because of the project, I met my dear friends Karen and Peter Harrity (Peter is a bird biologist that came to Hawaii to save the alala). It was on their lanai, that Karen and I learned how to first manipulate the palm fiber from fellow bird biologist Dr. Luanne Johnson. That was over 20 years ago. Both Peter and Luanne moved on to other projects but I did this piece in homage to them. They deserved to be honored and represented at this cool event. I hope I did them proud. The basket form was created from Alexander Palm sheath, with a natural edge front collar, stitched with waxed linen, the Hawaiian Ohia wood branch provides a resting spot for two ‘Alalā silhouettes made from paper, the ohia leaves are made from paper covered palm sheath, real ohia twigs with lichen and Spanish moss suggests the nest. The entire piece is finished and preserved with encaustic medium. It is available for purchase. On display daily from Sept. 3 – Oct. 9, 2016 at Volcano Art Center in Hawaii Volcanoes National Park. Open to the public with entry into the Volcanoes National Park. Super excited to share with you that earlier this month, I was awarded "Best of Show" with "Ho'okumu", at the Kahilu Theatre's "Art Off the Wall" exhibit. This piece is the largest one I have created (so far) and is available for sale. The exhibit features three dimensional work in any medium and runs through April 17th at the Kahilu Theatre in Waimea on the island of Hawaii. The exhibit is open Monday through Friday from 9 am to 1 pm, and also during performance productions. "Ho'okumu" represents the Big Island's natural elements in a big way as the vessel stands almost 3 feet high and 2 feet wide. 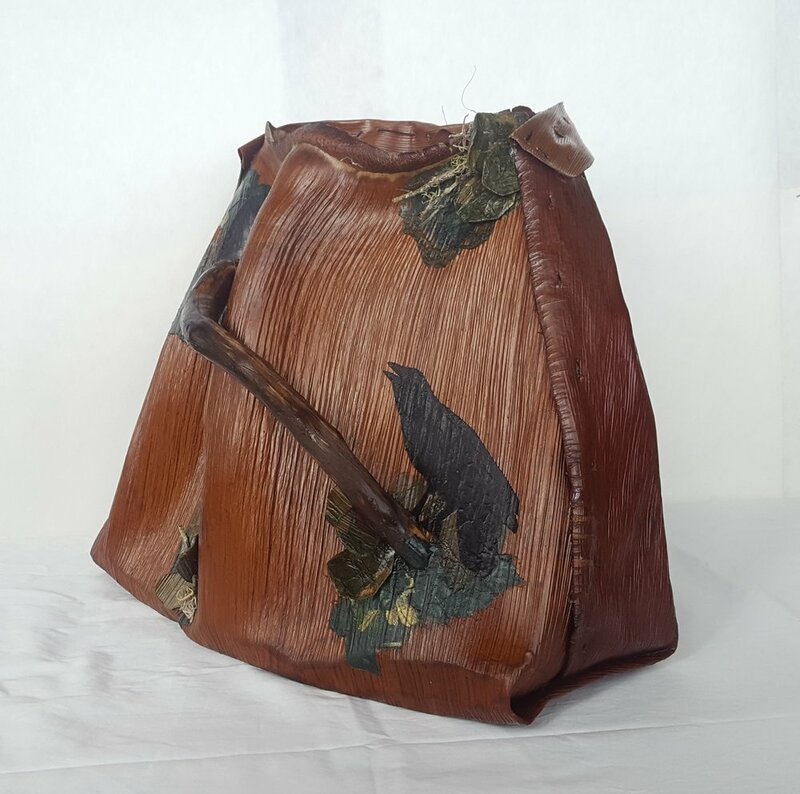 It has a base of native Koa wood and a wild, mature Hawaiian Mouflon Ram skull nestled into a silk lined vessel made from two gigantic sculpted Alexander Palm sheaths. 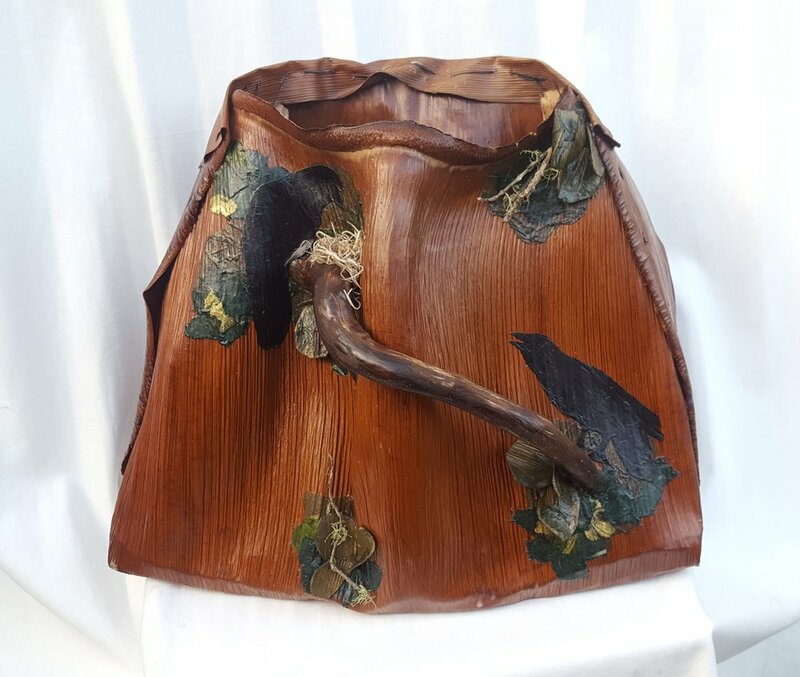 The vessel is hand stitched with waxed linen, and embellished with Venery and Ringneck Pheasant feathers, dried Sago Palm flowers with an amber chip studded leather trim. The majestic skull is adorned with a large Tiger Eye cabochon trimmed in more amber chips. I've been working in a new direction in creating specific intentions with my innovative sculptures. Ho'okumu means "the beginning" in Hawaiian and in addition to being the beginning sign of the zodiac, the ram is an important animal symbol in many current and ancient cultures, all over the world. Its shape is also reminiscent of the sacred feminine (reversed). Honoring the ram's qualities and symbolism, this piece's intention represents action, initiative and determination. It was created to remind us that every day is a new beginning, in which we are given the opportunity to trust in our own power and strength, our energy to act and our ability to balance as we climb.